In Simulacra, artist Elín Hansdóttir radically alters the gallery space and then returns it to its original state with only photographs serving as evidence. When viewers enter the gallery they see nine nearly identical photographs depicting a prosaic scene – a bouquet of flowers. Upon closer inspection, however, the scene becomes strange, as the flowers are depicted hovering in the center of the gallery where the building’s support column is located, literally defying gravity and logic. And as viewers scan one photograph after another the flowers seem to devolve from a state of bloom to death, as if the deterioration within a Dutch still painting has been divided into cells for a stopmotion animation film. To create this illusion Hansdóttir used techniques derived from the early years of Hollywood cinema, which she innovated for her own purposes. 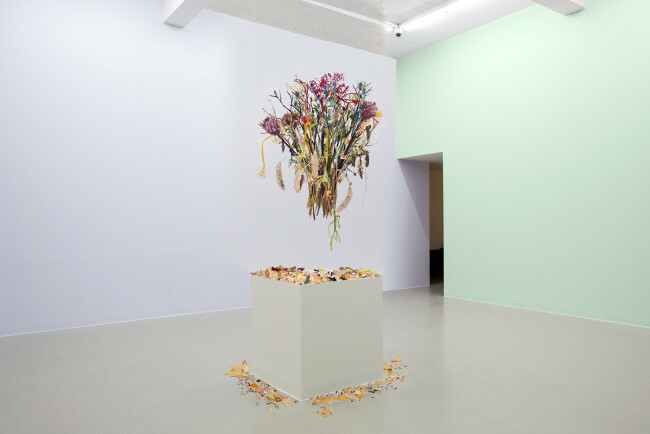 In this installation she photographed a bouquet of flowers over a period of one month and from these images painted glass mattes, which she installed around the gallery’s column. The artist then photographed the column, which, courtesy of the matte paintings around it, seemed to disappear. The glass mattes were then removed. Upon entering the gallery viewers will anxiously look from the photographs on the wall to the site they depict, finding only a support column in the gallery but expecting more. Whether miracle or a trick, these photographs at i8 depict an event that interrupts the scene of normality, and such events, as Alain Badiou notes, reveal the multiplicity that lies at the foundation of reality, shaking our sense of continuity. As in prior installations by this artist the viewer serves as a catalyst. In Trace (2010), for example, viewers scan the wall like a film projector, piecing together still images into a coherent narrative. Similarly, in Path (2008) viewers walk down a corridor as they attempt to assemble a host of discrete and ungrounded experiences into a phenomenological whole. And in Suspension of Disbelief (2015) Hansdóttir introduces the glass matte technique, thereby obliging viewers to composite installation with representational imagery. While she continues in this manner Simulacra is more about time than space. It is also more layered and more explicitly about history. It thus compels viewers to do a different kind of work than her previous installations do. If un lieu de mémoire is a spatial marker indicating a mnemonic absence, this installation comes at the problem of memory from multiple angles. The artist’s layered process serves as an index to the different rhythms that once infused daily life—the quick clip of stop-motion cinema, the languorous stillness of the still life painting, the “decisive moment” of photography, and the timelessness of religious symbolism. Conversely, these invoked rhythms suggest that the contemporary gallery—with its white walls, cement floor, and central support column—buries memory. Such memories reemerge in Simulacra uninvited. Elín Hansdóttir, (b. 1980) lives and works in Reykjavik and Berlin. She studied at the Iceland Academy of the Arts and Kunsthochschule Weissensee in Berlin completing her MA in 2006. Solo shows include Suspension of Disbelief at KW Institute for Contemporary Art, Berlin (2015); Trace at i8 Gallery (2010); Parallax at the Reykjavik Art Museum (2009) and Universolo at Unosolo project space, Rome (2009). Group shows include Disruption at Reykjavik Art Museum – Ásmundarsafn, Beyond Reach at Den Frie Udstillingsbygning, Copenhagen (2014); Higher Atlas, Marrakech Biennale, Morocco (2012); Space Revised, Künstlerhaus Bremen (2009) and Art Against Architecture at the National Gallery of Iceland (2008). In 2007 she was commissioned for Frieze Projects, Frieze Art Fair, London. NOWs: Hans-Henning Korb presents Kaya Cynara at Empty Gallery, Hong Kong Spread across three discrete exhibition spaces on Empty Gallery’s new 18th floor, Kaya Cynara takes the form of a modular installation comprising ritual performances, expanded sculpture, video installation and virtual reality. These complex environments are further activated by Korb’s rituals in which the spectator is guided through a ceremonial interaction with the various sculptures and objects. With each exhibition space representing a different stage of consciousness, the spectator experiences Kaya Cynara as a successively developing relationship between virtual and actual, nature and technology, inside and outside. Korb’s work reflects on the ontological convergence of these myriad spheres within our hyper-mediated present and the generative role of the human within this complex ecosystem. Designed from the outset as a mobile composition existing in different locations and time scales, Kaya Cynara includes ceramics by Jonas Wendelin Kesseler and music by Robert Lippok. Trailer for Kaya Cynara at Empty Gallery, Hong Kong. 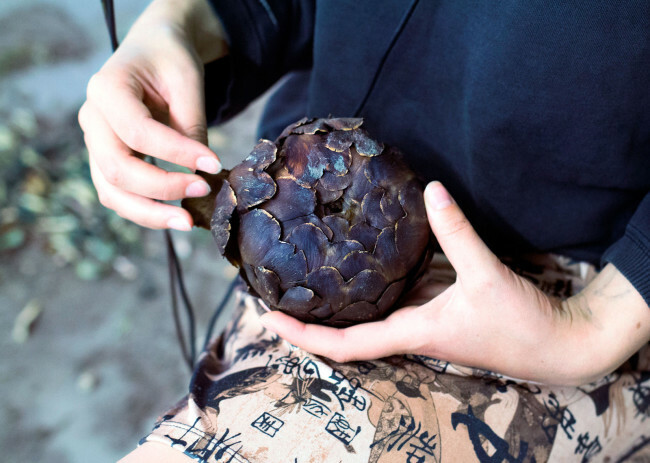 Credits: Hans-Henning Korb, 2016 / Voice - Jack Barnett / Actors - Zoë-Louise Estève & Henry McMaster	Hans-Henning Korb will present Kaya Cynara, his first solo exhibition in Asia. Spread across three discrete exhibition spaces on Empty Gallery’s 18th floor, Kaya Cynara takes the form of a modular installation comprising ritual performances, expanded sculpture, video installation, and Oculus Rift VR. Kaya Cynara includes ceramics by Jonas Wendelin Kesseler and music by Robert Lippok. Empty Gallery re-opens its new 4,500-sq-foot black-cube facilities in Tin Wan with two exhibitions: an immersive installation of Takashi Makino’s Cinema Concret, and a multi-sensory conceptual environment by Hans-Henning Korb. The opening will be followed by an after-party with performances by Mark Fell, Rian Trianor, Robert Lippok, and Terre Thaemlitz aka DJ Sprinkles (as special guest). Takashi Makino will present an installation version of his 2015 film Cinema Concret, with a new score by the Dutch experimental musician Machinefabriek. Find further images here. Hans-Henning Korb (b. 1988) lives and works in Berlin where he graduated from the Berlin University of the Arts, in 2016. Korb’s work transgresses traditional categories, combining sculpture, installation, and performances that involve music, film, computer animation, virtual worlds, plants, and organic processes. Korb completed an MA at the Berlin University of the Arts and studied in the class of Hito Steyerl and the Institute for Spatial Experiments (Institut für Raumexperimente) of Olafur Eliasson. He was a visiting student at the Addis Ababa School of Fine Arts in Ethiopia and the Hunter College in New York. NOWs: Hans-Henning Korb presents Kaya Cynara at Empty Gallery, Hong Kong Spread across three discrete exhibition spaces on Empty Gallery’s new 18th floor, Kaya Cynara takes the form of a modular installation comprising ritual performances, expanded sculpture, video installation and virtual reality. These complex environments are further activated by Korb’s rituals in which the spectator is guided through a ceremonial interaction with the various sculptures and objects. With each exhibition space representing a different stage of consciousness, the spectator experiences Kaya Cynara as a successively developing relationship between virtual and actual, nature and technology, inside and outside. Korb’s work reflects on the ontological convergence of these myriad spheres within our hyper-mediated present and the generative role of the human within this complex ecosystem. Designed from the outset as a mobile composition existing in different locations and time scales, Kaya Cynara includes ceramics by Jonas Wendelin Kesseler and music by Robert Lippok. Trailer for Kaya Cynara at Empty Gallery, Hong Kong. Credits: Hans-Henning Korb, 2016 / Voice - Jack Barnett / Actors - Zoë-Louise Estève & Henry McMaster	Hans-Henning Korb will present Kaya Cynara, his first solo exhibition in Asia. Spread across three discrete exhibition spaces on Empty Gallery’s 18th floor, Kaya Cynara takes the form of a modular installation comprising ritual performances, expanded sculpture, video installation, and Oculus Rift VR. Kaya Cynara includes ceramics by Jonas Wendelin Kesseler and music by Robert Lippok.Empty Gallery re-opens its new 4,500-sq-foot black-cube facilities in Tin Wan with two exhibitions: an immersive installation of Takashi Makino’s Cinema Concret, and a multi-sensory conceptual environment by Hans-Henning Korb. The opening will be followed by an after-party with performances by Mark Fell, Rian Trianor, Robert Lippok, and Terre Thaemlitz aka DJ Sprinkles (as special guest). Takashi Makino will present an installation version of his 2015 film Cinema Concret, with a new score by the Dutch experimental musician Machinefabriek. Find further images here. Hans-Henning Korb (b. 1988) lives and works in Berlin where he graduated from the Berlin University of the Arts, in 2016. Korb’s work transgresses traditional categories, combining sculpture, installation, and performances that involve music, film, computer animation, virtual worlds, plants, and organic processes. 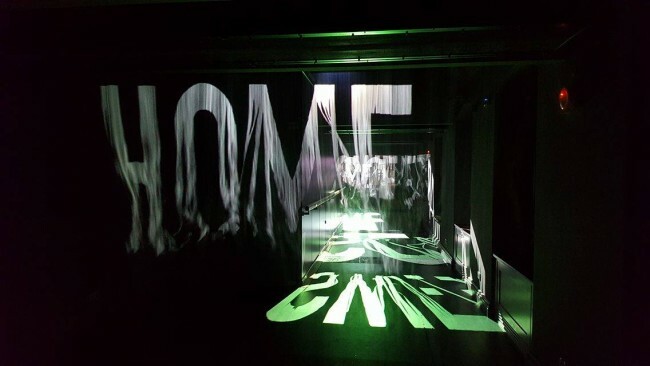 Korb completed an MA at the Berlin University of the Arts and studied in the class of Hito Steyerl and the Institute for Spatial Experiments (Institut für Raumexperimente) of Olafur Eliasson. He was a visiting student at the Addis Ababa School of Fine Arts in Ethiopia and the Hunter College in New York.